Is Italy on your bucket list? 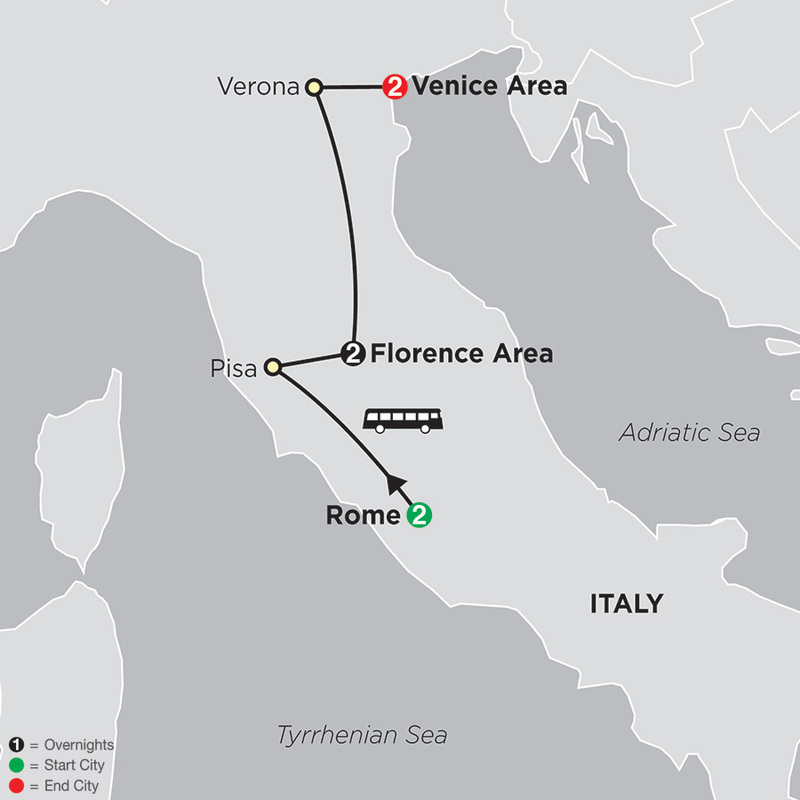 Why not join our own Lori Curtis for a wonderful tour of Italy at an incredible price point, only $1099 per person? This tour includes the big four, Rome, Pisa, Florence and Venice, along with the ever romantic Verona and Juliet's balcony. Tour dates are March 17-23, 2019. Isn't this the perfect Spring Break get-away for 2019? Majestic Rome, with its historical sites beyond compare, is your first discovery on your affordable Italy vacation. From St. Peter’s Square at the heart of the Vatican, to the Colosseum and Roman Forum, you’ll see why this “eternal city” is a must-see on every traveler’s list. Take a guided walking tour of Florence to soak up the world-famous squares and palazzos of the ornate city, including the Duomo and the Baptistry’s bronze door (“Gate of Paradise”). Off to Venice via Verona – the setting for Shakespeare’s fabled tragedy of Romeo & Juliet. Travel north and cross the Po River to fabled Verona, setting for Shakespeare’s Romeo & Juliet. See Juliet’s balcony—and be sure to rub the shining breast on her statue for good luck! Also, marvel at the ancient Roman Amphitheater, where gladiators used to fight. Built in the 1st century AD, it is now a popular venue for the world-famous opera festival and other well-known artists' performances. Continue to the Venice area for two overnights. One of the most unique cities on Earth, Venice is a place of unmatched beauty and a feast of fantastic sites. View the delightful criss-crossing canals, the gondolas, arched bridges, palaces, and piazzas. Your included orientation features a BOAT RIDE to St. Mark’s Square and a visit to a Venetian GLASSBLOWING WORKSHOP. Later, explore at leisure on your own, join one of our optional excursions, or just relax, sipping a cappuccino or typical Venetian drink called spritz at one of the many bars or cafés.